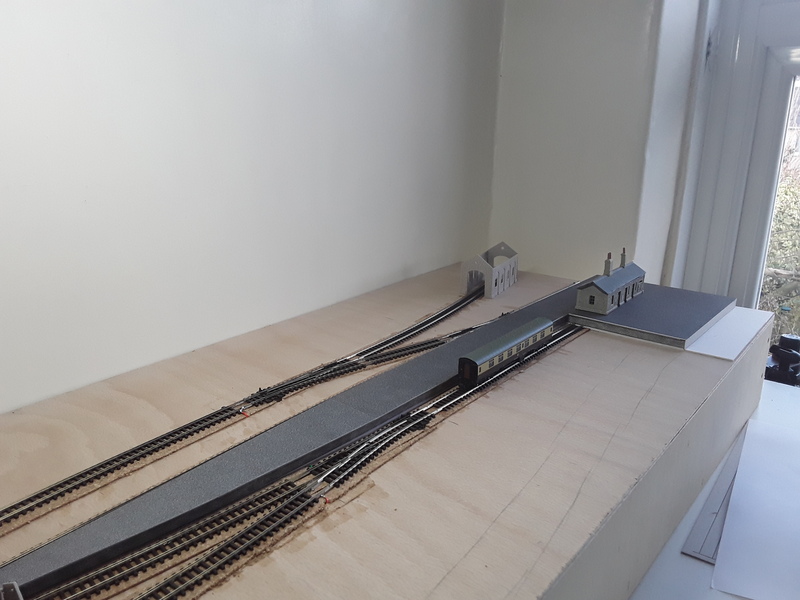 I’ve made a start on the coombe side at the back of the layout. 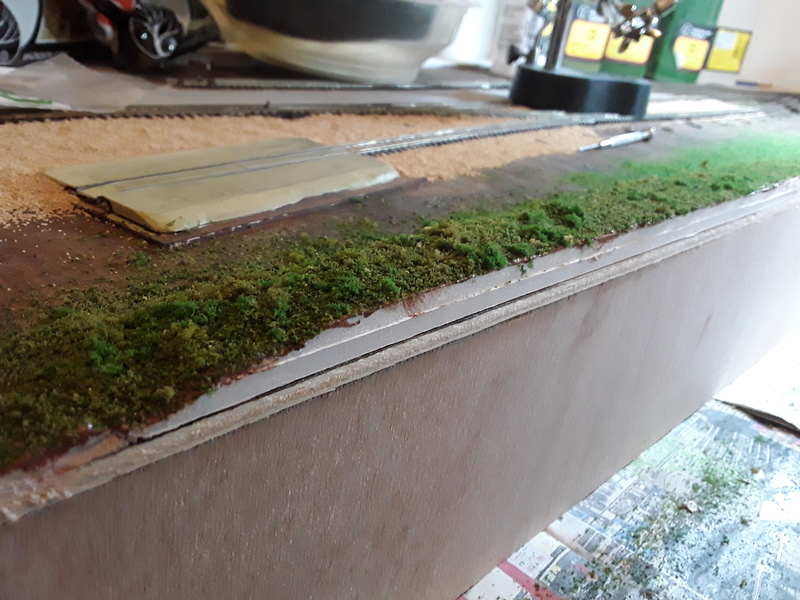 First a coat of brown paint then a base coat of three shades of fine turf. I also added some course turf on one patch. I’m not sure it’s quite the right mix of shades so I’m mulling it over before adding some static grass. Once that’s done, I’ll be adding underbursh, shrubs and a few trees. 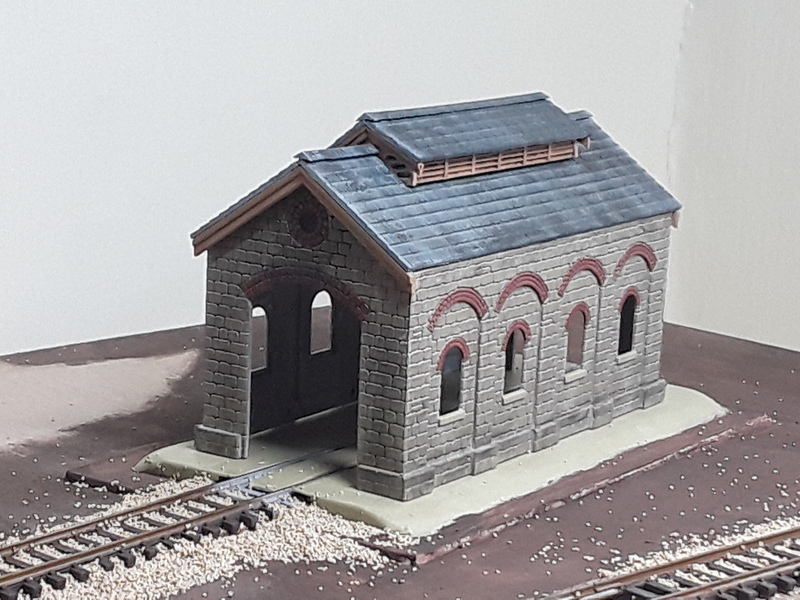 The signal box is also coming along. 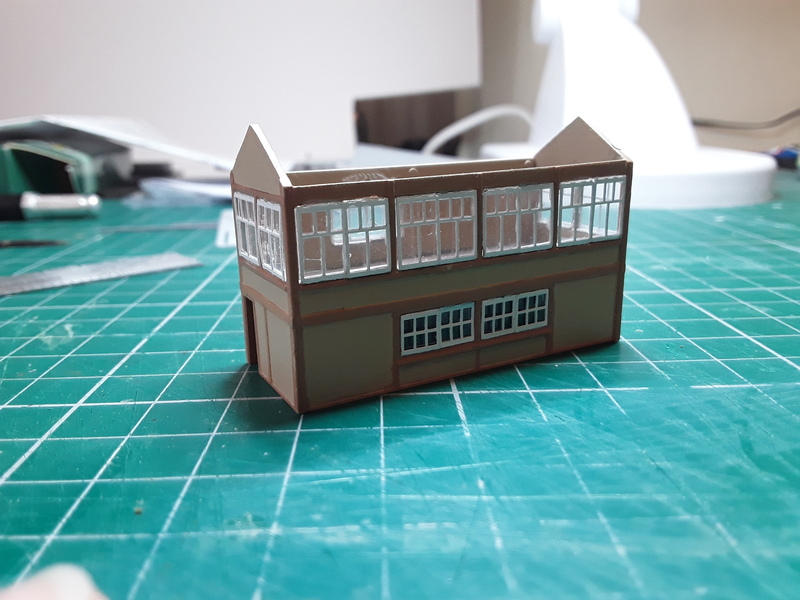 The window frames are fitted and glazed. It tried glazing them first before fitting but found it a lot easier glazing them once the frames were superglued in. I used Humbrol Clearfix to attach the perspex glazing. Next I turned my attention to the signal and point lever frame and the etched levers. Quite fiddly! 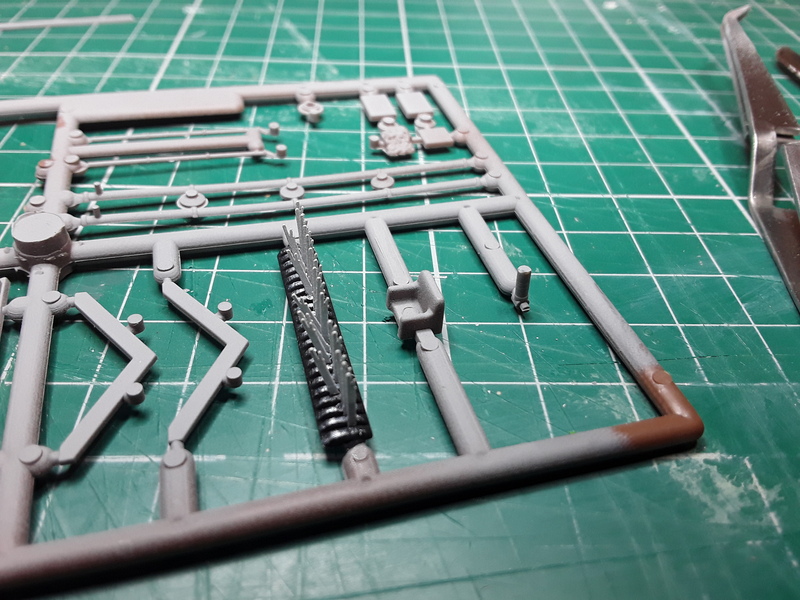 First I superglued the levers to the frame base whilst it was still on the sprue. Then I painted them. Black at the bottom, silver for the handles and releases at the top and the body of the levers according to their use. Red for home siganls, yellow for distant, blue for points, black for locking, and one white as a spare. 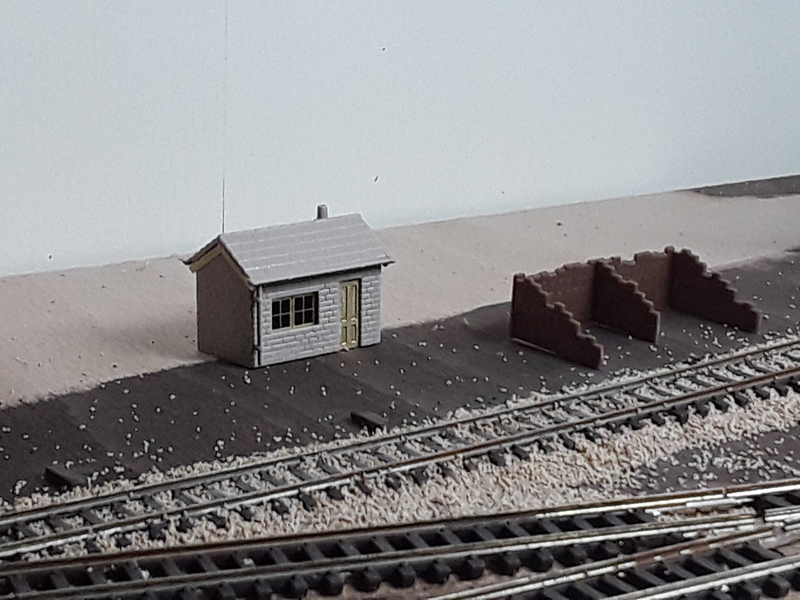 Next I’ll turn my attention to the block instruments and signal box cabin furniture. 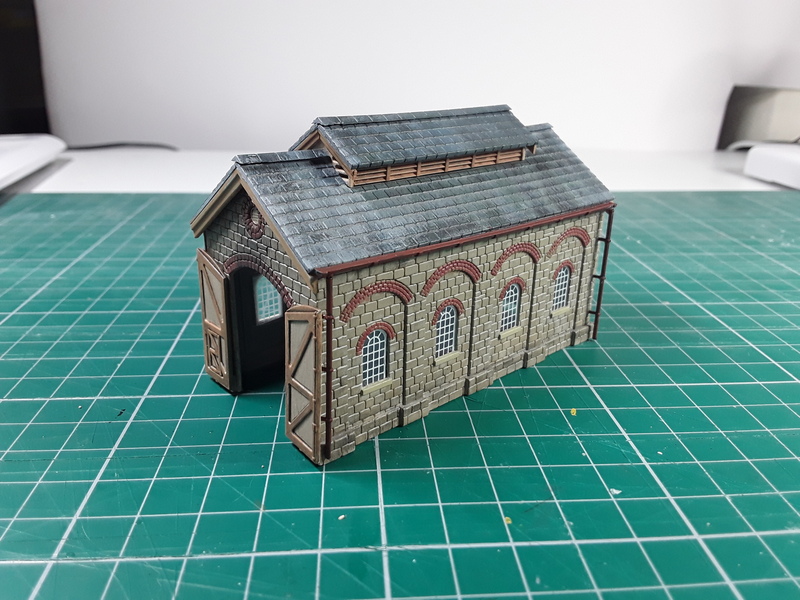 Over the last few evenings, I’ve just about completed the single road loco shed, coal staithes and office. 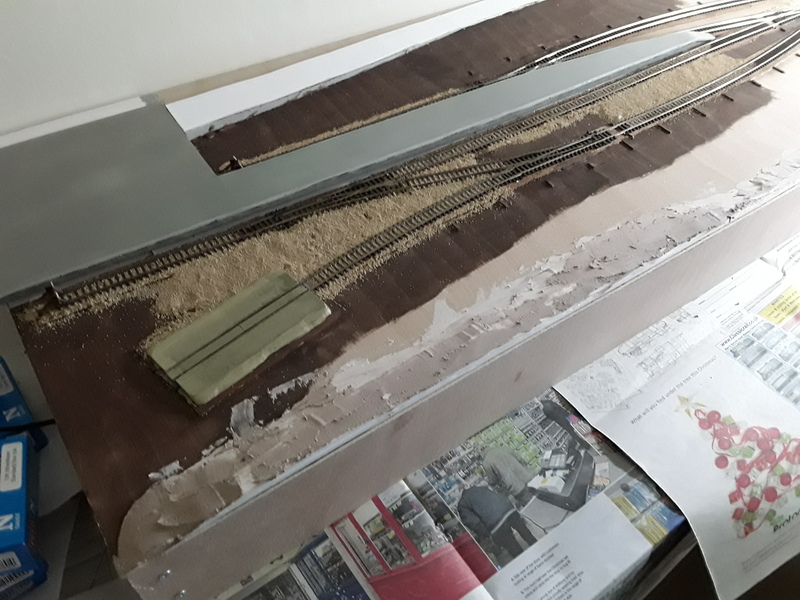 Final weathering will take place once in situ. 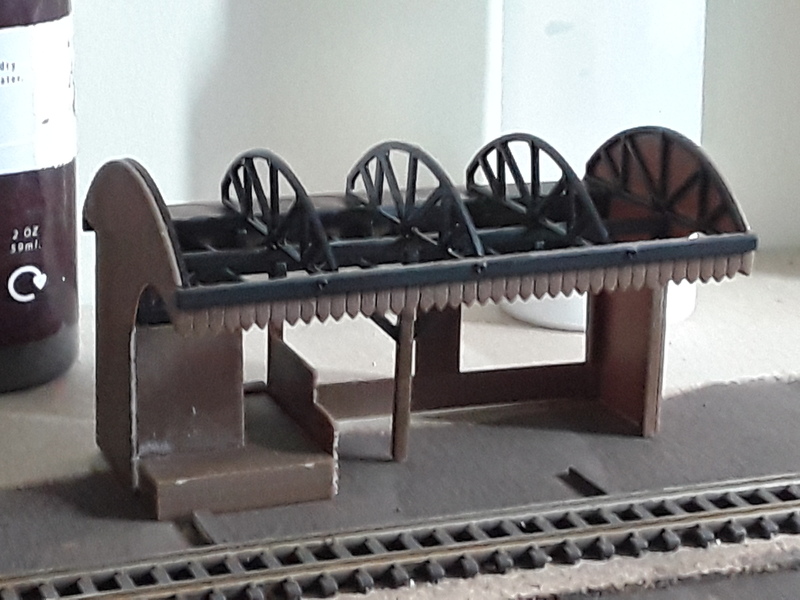 Meanwhile, work continues on the Coal Merchants. 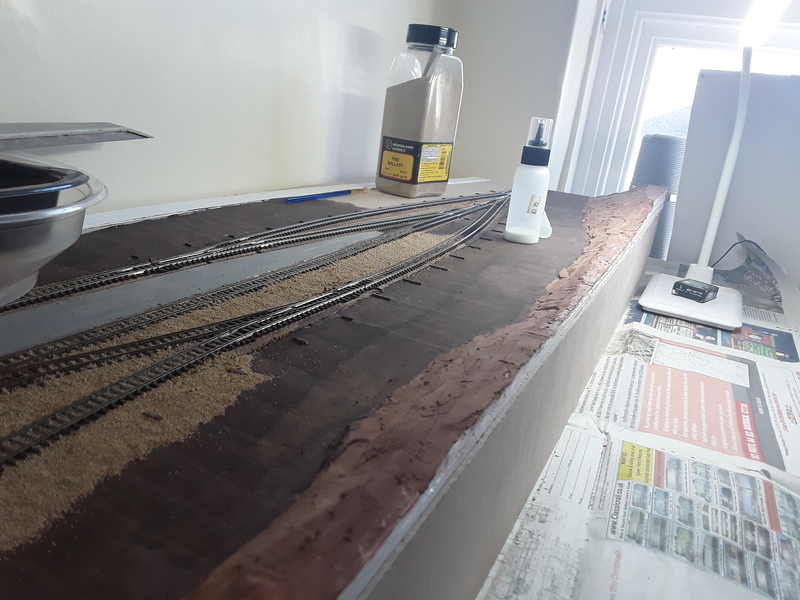 The last weekend saw a brown undercoat being painted trackside prior to ballasting. 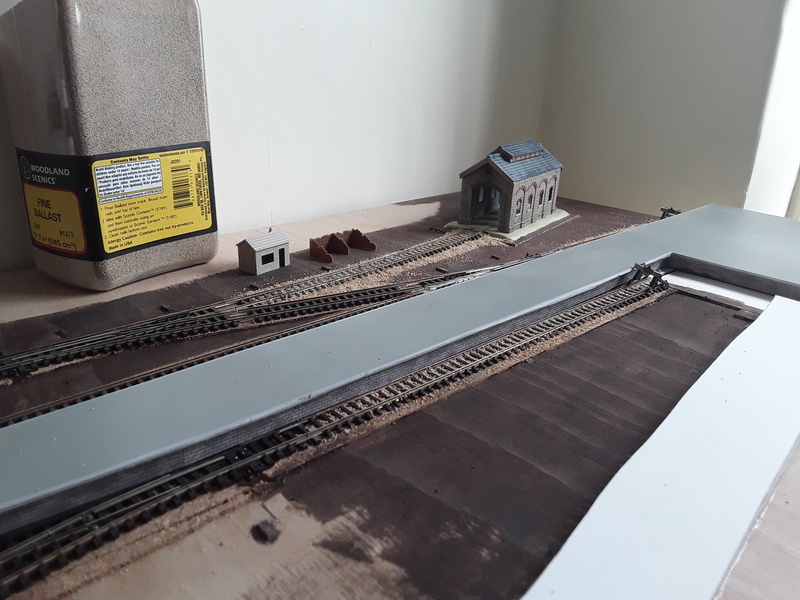 For Dartley Coombe I’m using Woodland Scenics Buff Fine Ballast. 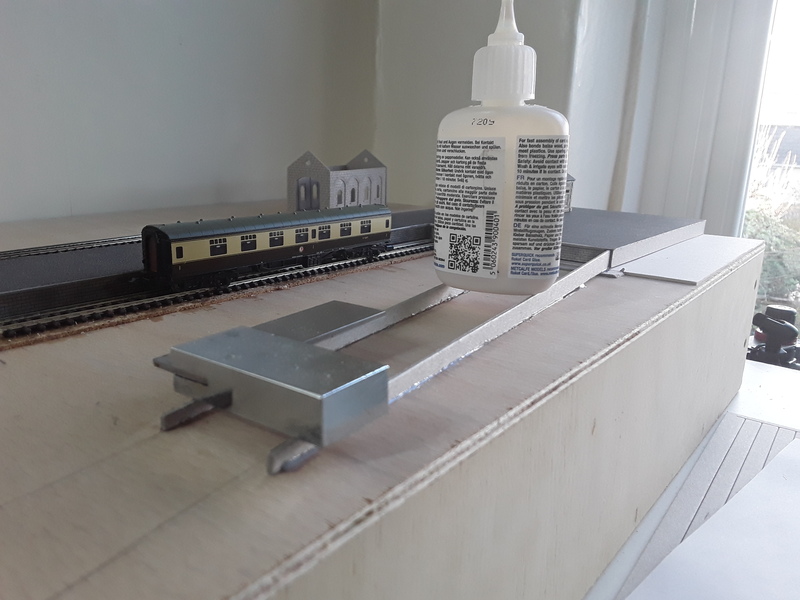 This is a very fine ballast and I quickly found that my normal spray bottles were too powerful for it. 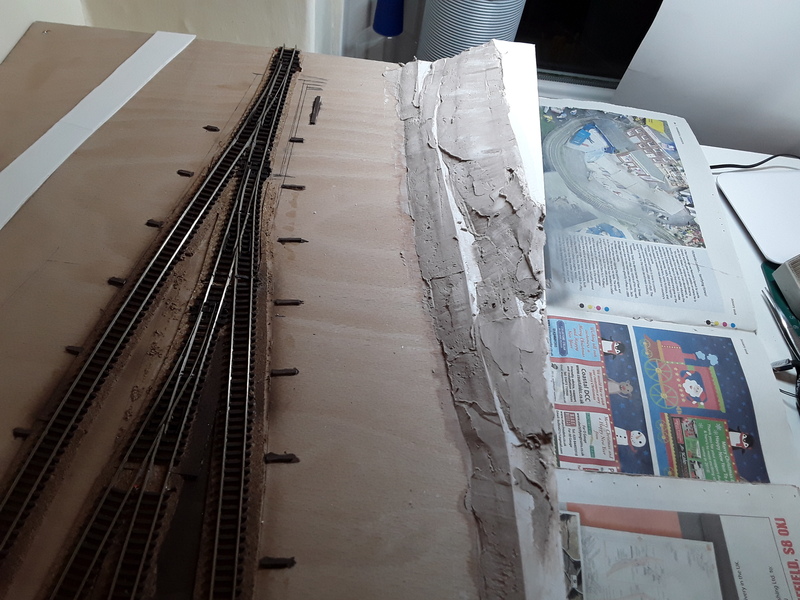 When dampening it down, I was tending to push ballast around so I wasn’t getting as neat a finish as I wanted. Luckily our local art shop had an artist’s misting spray which is much better suited to the task. 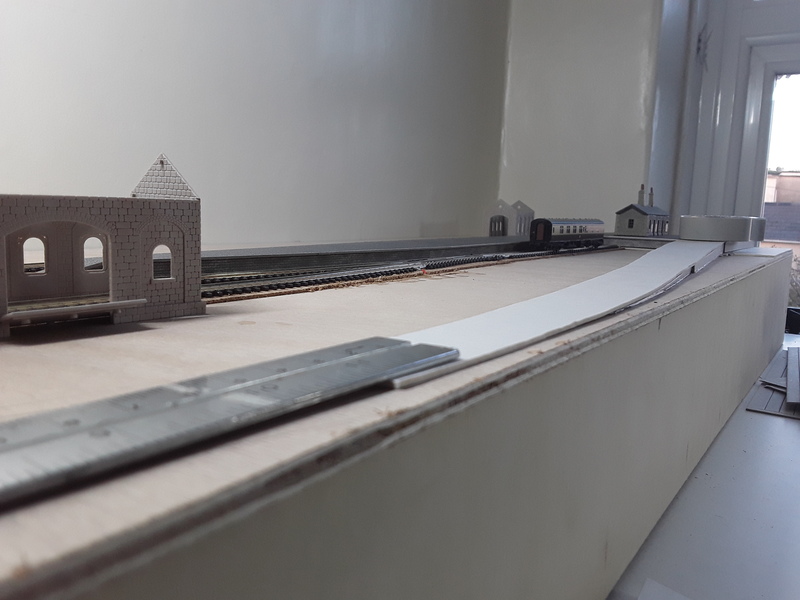 I wanted to get the buildings at the back of the layout clear in my mind before I could turn my attention to building up the land at the back so I decided to start building the loco shed, coal merchants, staithes and office. None are quite finished yet but hopefully will be in the next day or two. All are Ratio kits. 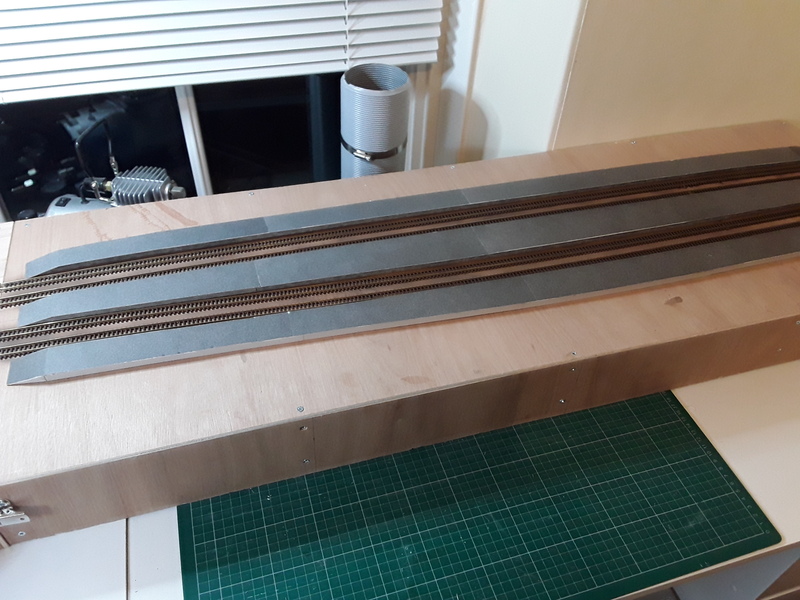 The grey area in the pictures is where the platform stands. 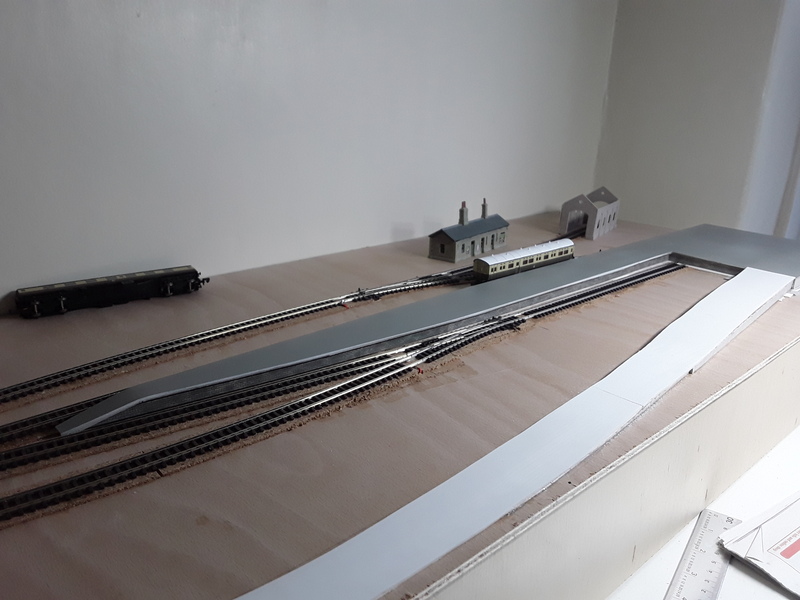 I’ve done a little more work over the weekend with the platforms sprayed including a white edging strip. 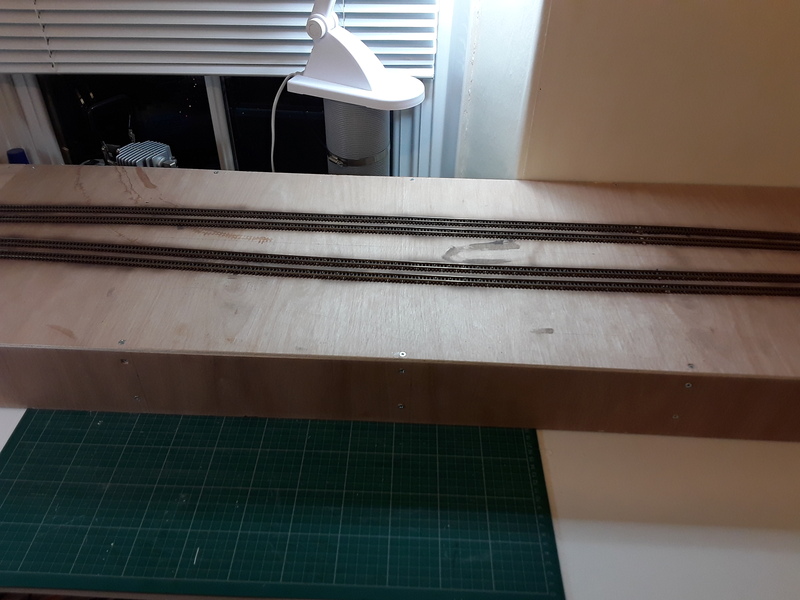 I’m not 100% sure about the colour and the amount of white edging so am going to live with it a bit and see how I feel about it before giving it a coat of matt varnish. The colour is not quite so grey/blue in real life and consists of light grey, earth brown and white. 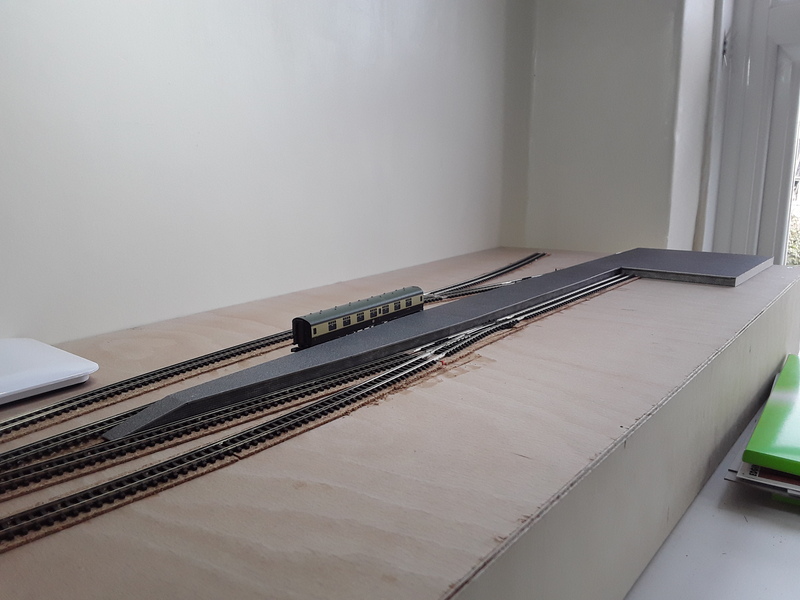 I then marked out the base for the loco shed and used some Daler board to raise the level to match that of the cork underlay before glueing the base sections down. 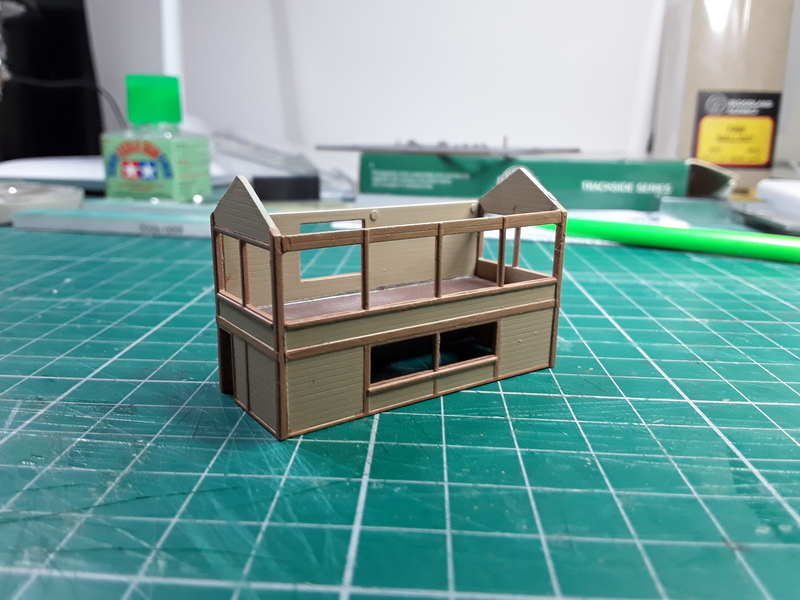 I then started assembling the good shed walls, roof and ventilated to roof as three separate sub assemblies. These were then given a light coating of Vallejo primer. 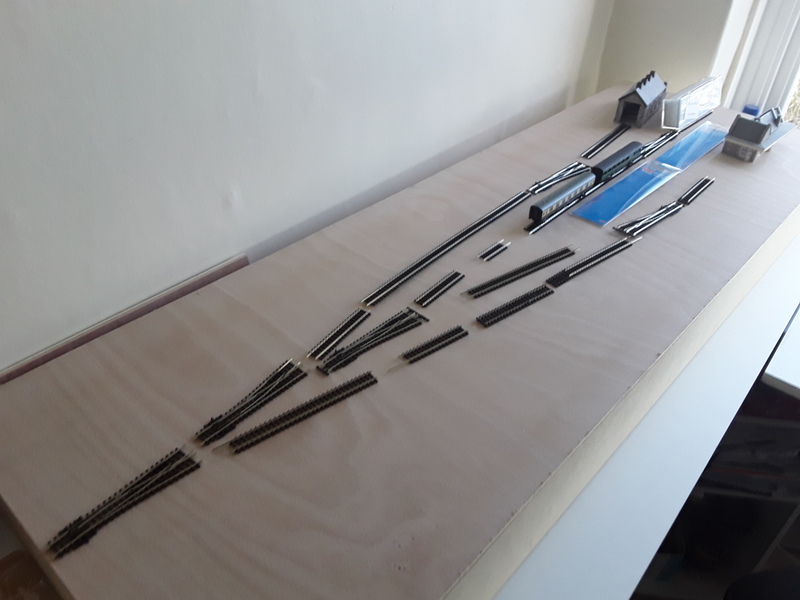 Here are the sub assemblies temporarily dry assembled together in situ. 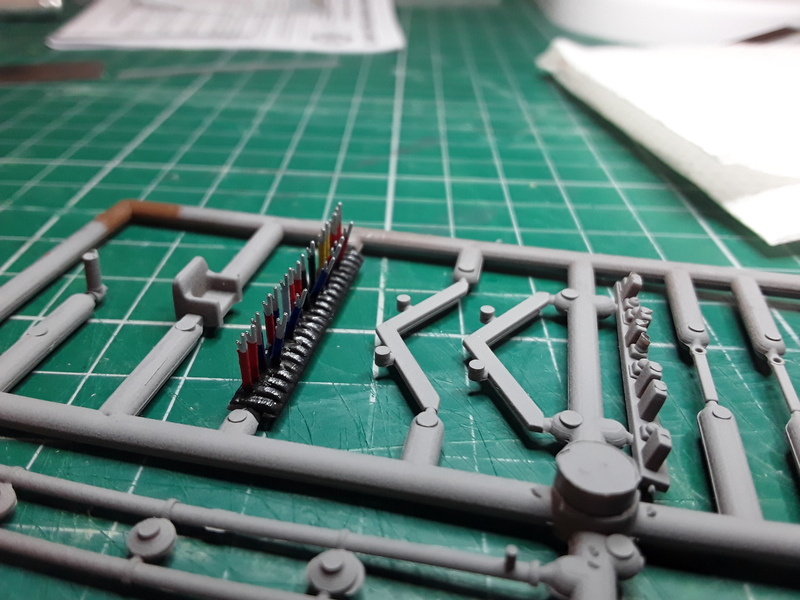 Next job will be to get them painted. 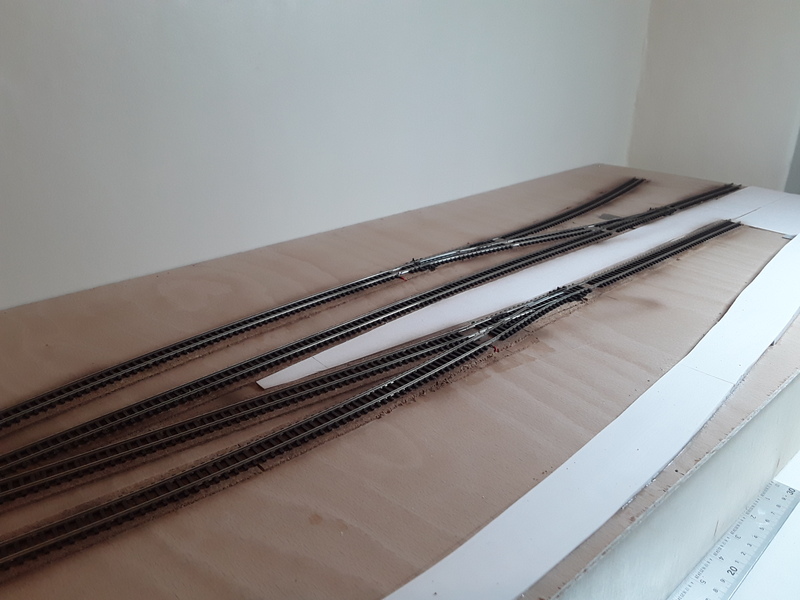 Over the Christmas period, I reached a point on the round the room layout where I realised I wasn’t sure about the next section of track plan and felt I would benefit from concentrating on something else for a bit to keep my mojo. 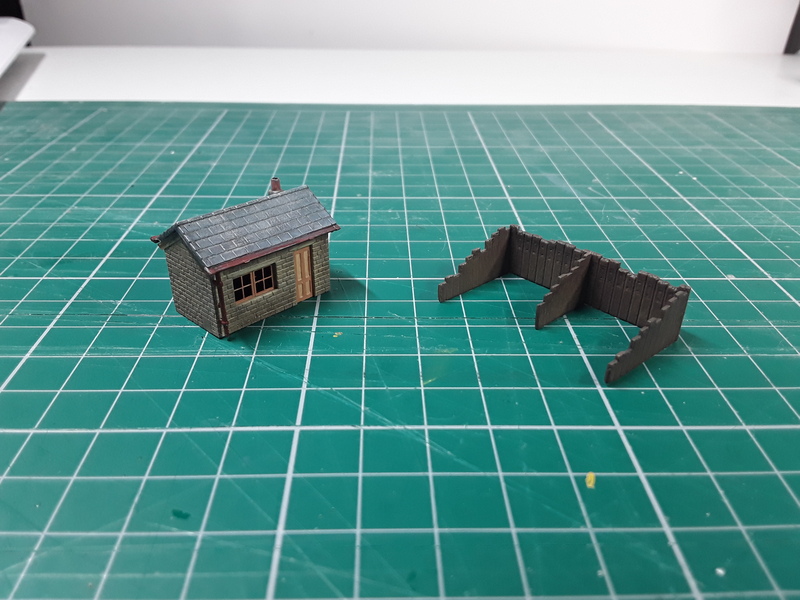 My wife wants us to do a small exhibition layout and I wanted to try code 55 so I decided to use some Christmas money to buy some. 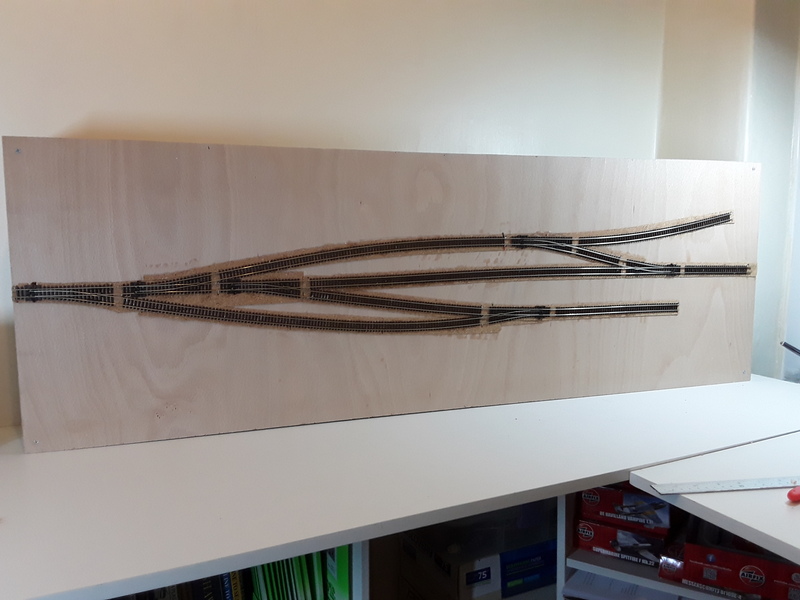 I’d already been playing around for a while with a variation on the BRM layout Edgeworth as a countryside GWR branch terminus, had some 9mm ply 10cm strips and 5.5mm 4×2 sheets in the workshop and a long weekend over New Years so decided to knock a board up and have a play. 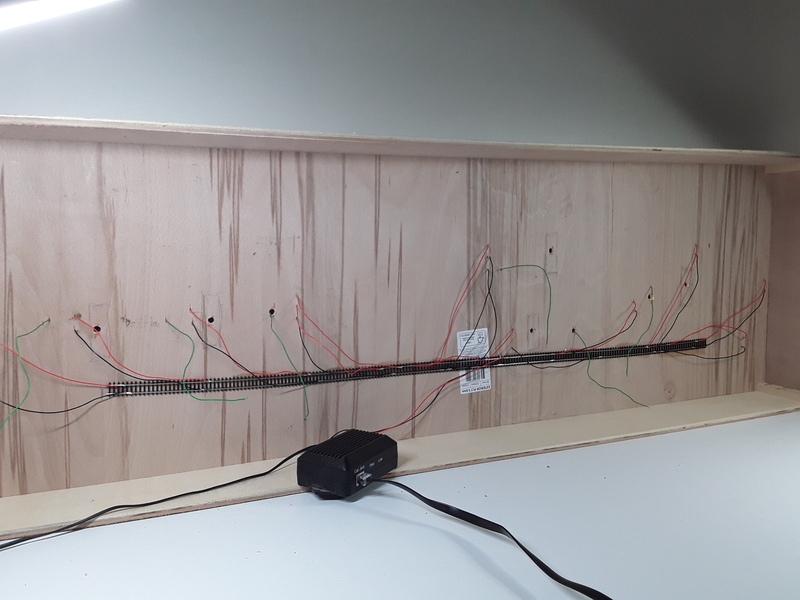 Things moved quite quickly and before I knew it the main scenic board (48 inches by 16 inches) was built, cork cut and glued down, track laid out, connected and tacked down with Copydex, droppers soldered, frogs wired etc. 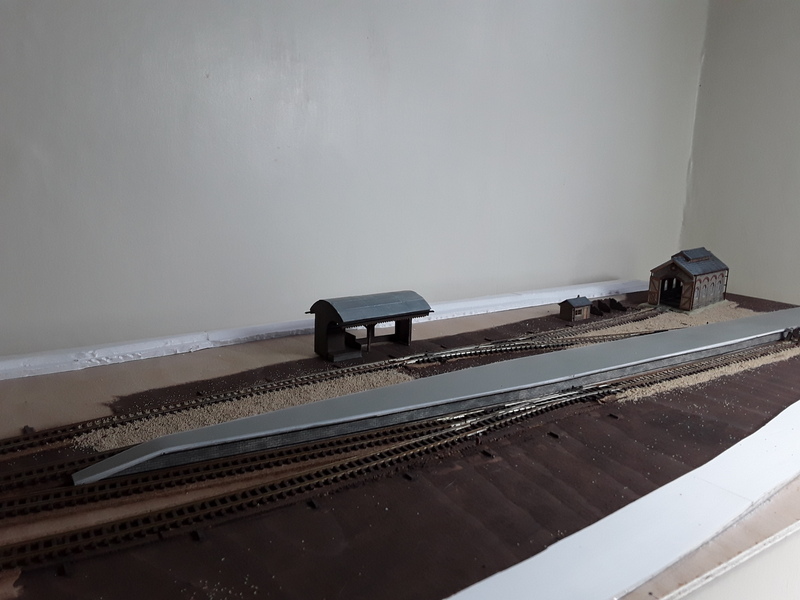 Platforms are Metcalfe kits which are being topped with 20thou plasticard and the road bed is made from Daler board again topped with plasticard. 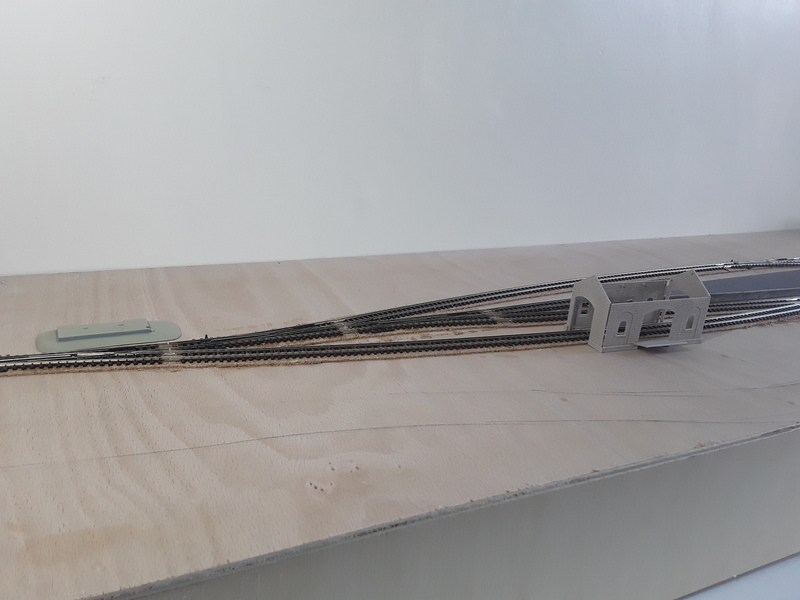 All droppers on this board connect to a lenght of code 80 and it is DCC. Point motors are still to be added and I plan on trying out the Gaugemaster DCC80 frog juicers. 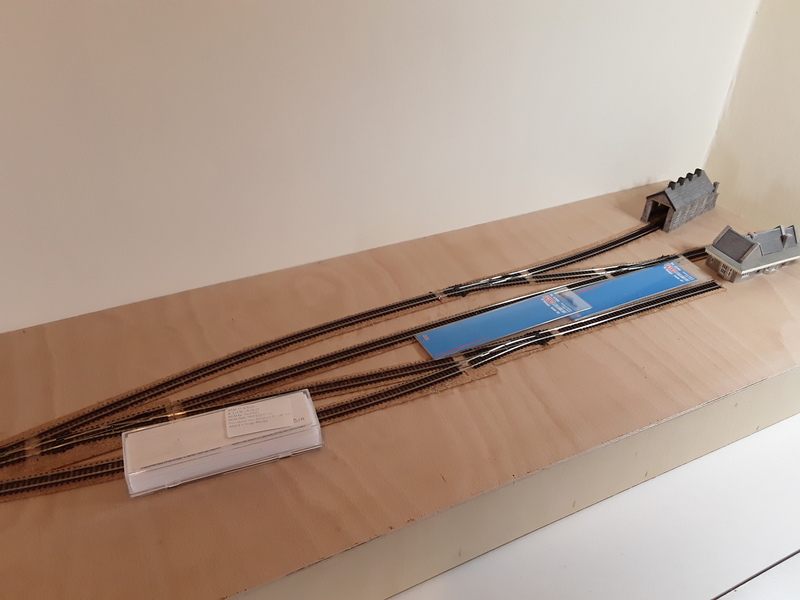 There will be another board to the left with a hidden fiddle yard with a single track leading to this board. 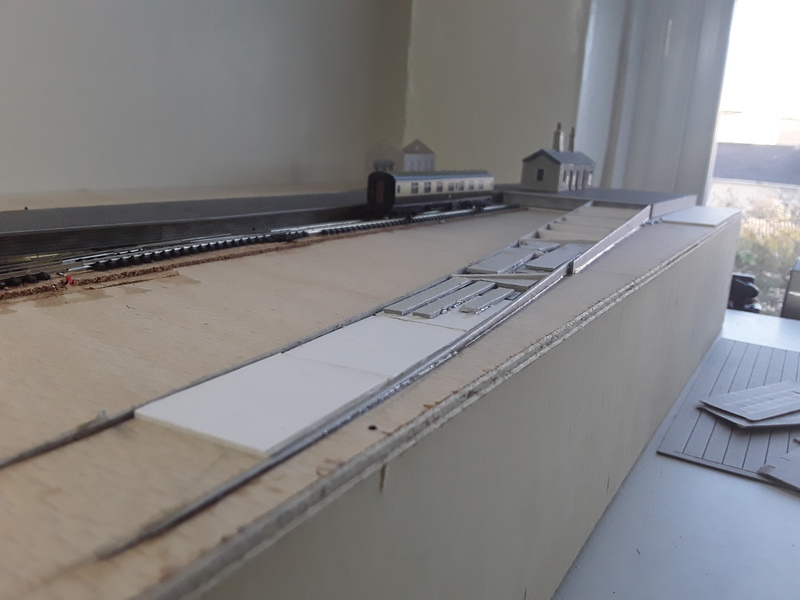 The top platform face has a run around loop and spur to a single engine shed while the lower bay platform will be for push/pull units. 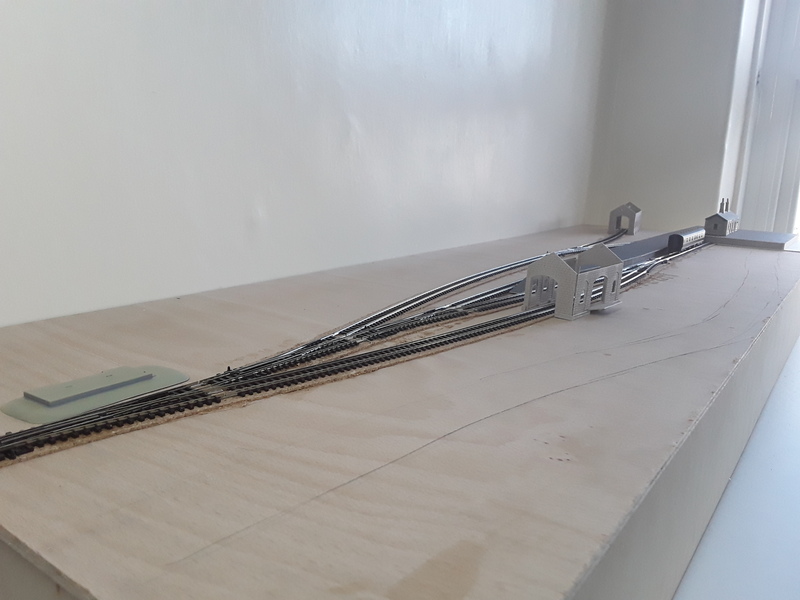 There is also a goods loop at the bottom which utilises the bay as a headshunt. 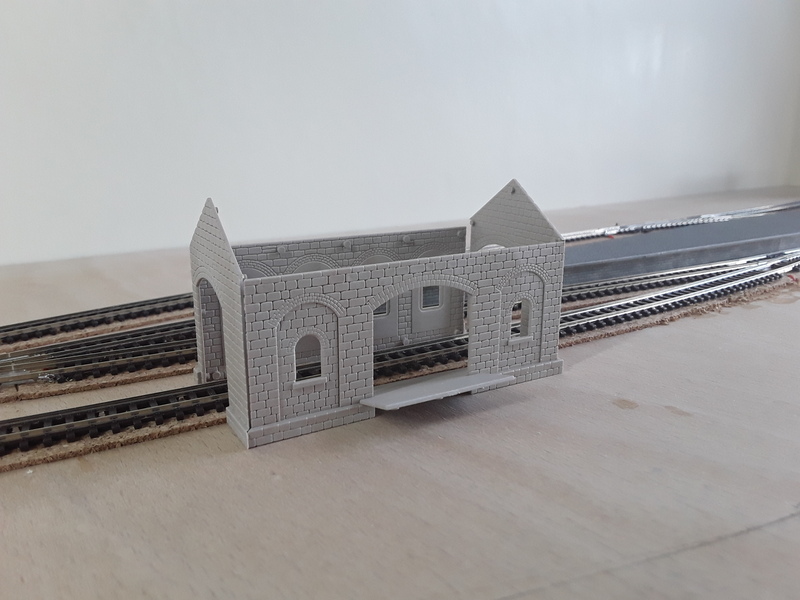 All infrastructure will be Ratio kits and some scratchbuilding; station building, signal box, goods shed, engine shed, water tower, coal merchants, staithes etc. 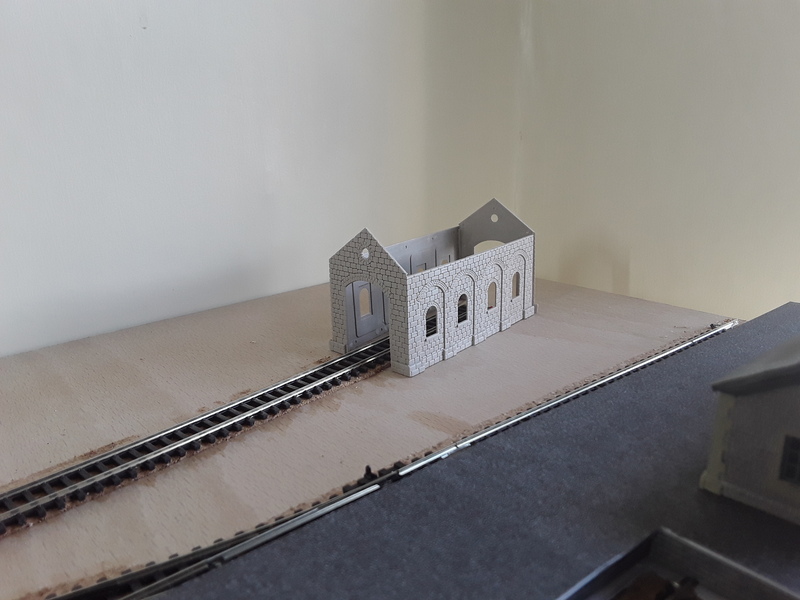 I have use some temporary structures to help gauge the positioning. 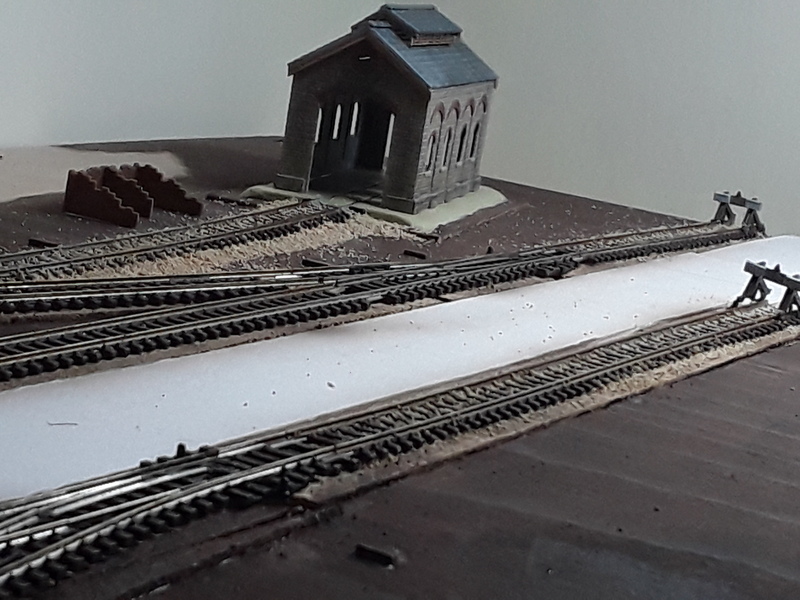 Coming away from the station, the terrain will rise up so the line is running through a valley. For this I will be using foam board layers. 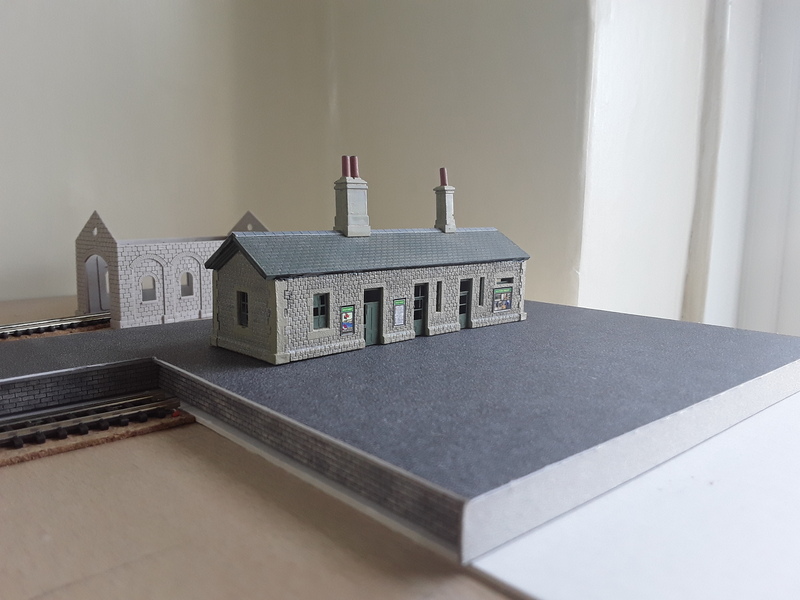 As we both like the idea of model villages, we might add a small extension board to the right of the station for the station masters house, part of a village etc. 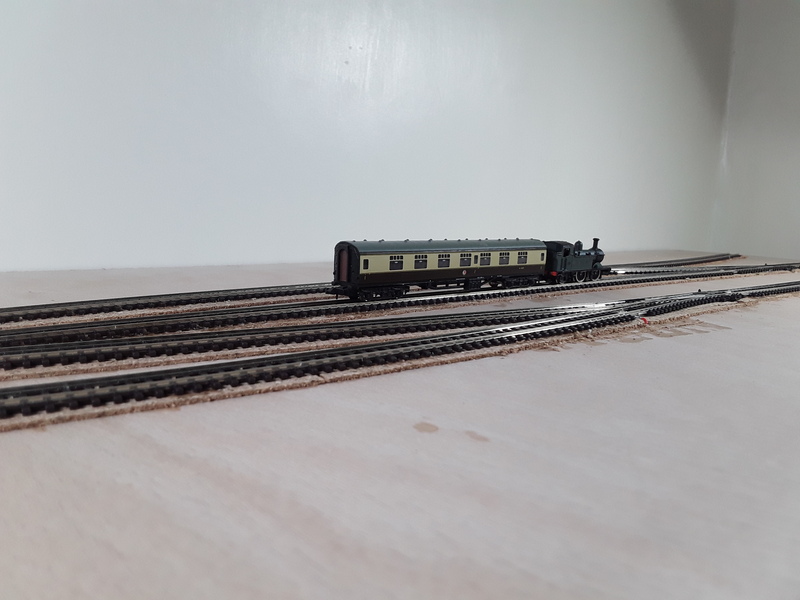 And before I leave you with some pictures, I must say I make absolutely no apology for the twee name of the layout, Dartley Coombe. 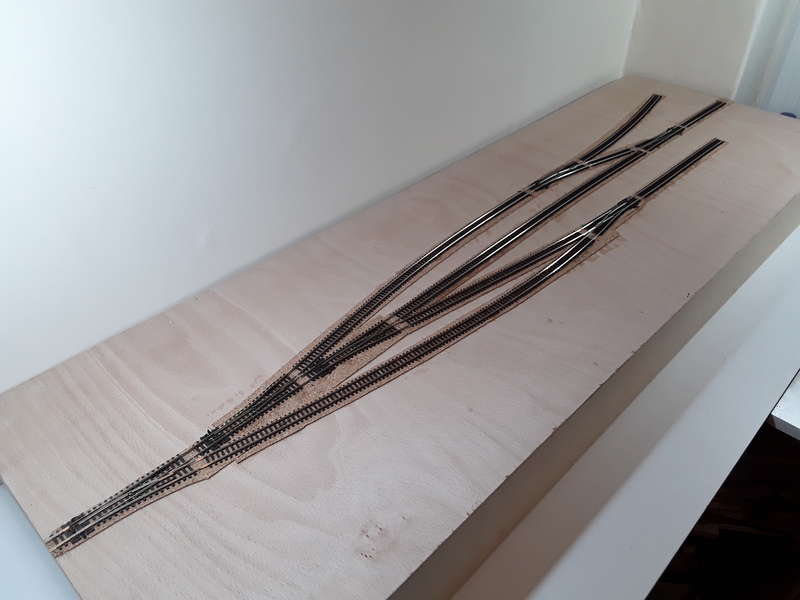 The first of the track laying commenced with the 4 lines running through the station using Peco code 80 wooden sleepered flexi track. 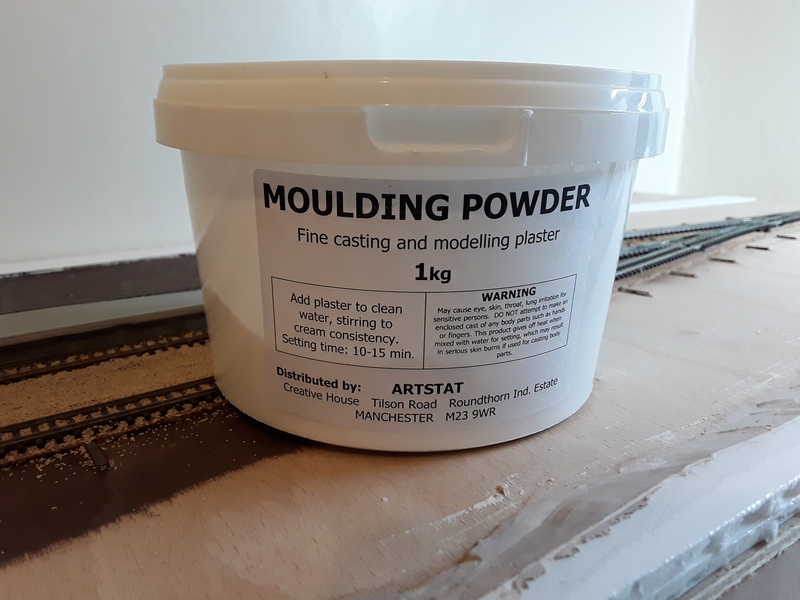 It was fixed down with blobs of PVA, although, as I had to lift and adjust it I decided I needed to go and buy some Copydex to use before I laid any more. As I had the airbrush and compressor to hand, I decided to give it a blast of sleeper grime. 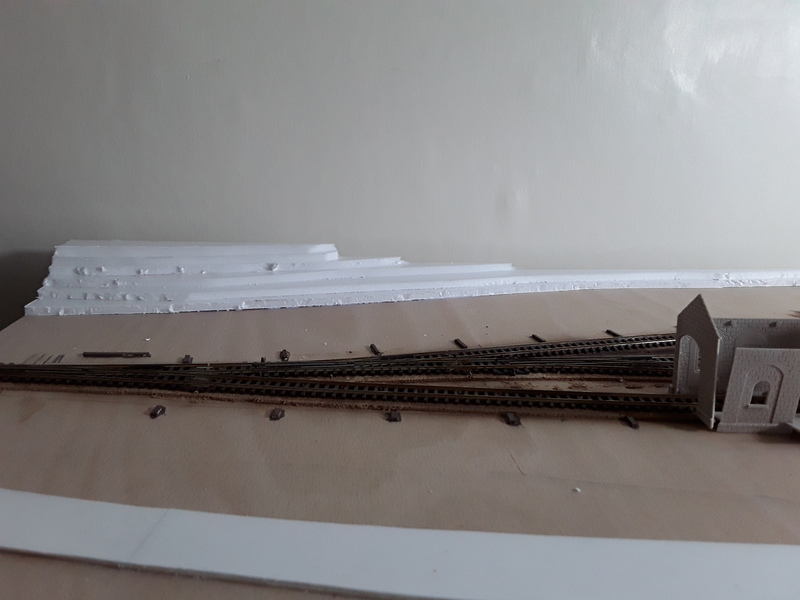 I think I’ll hold off any further pre-ballasting weathering until I’ve laid all the rest of the track so I can do it all in one go. 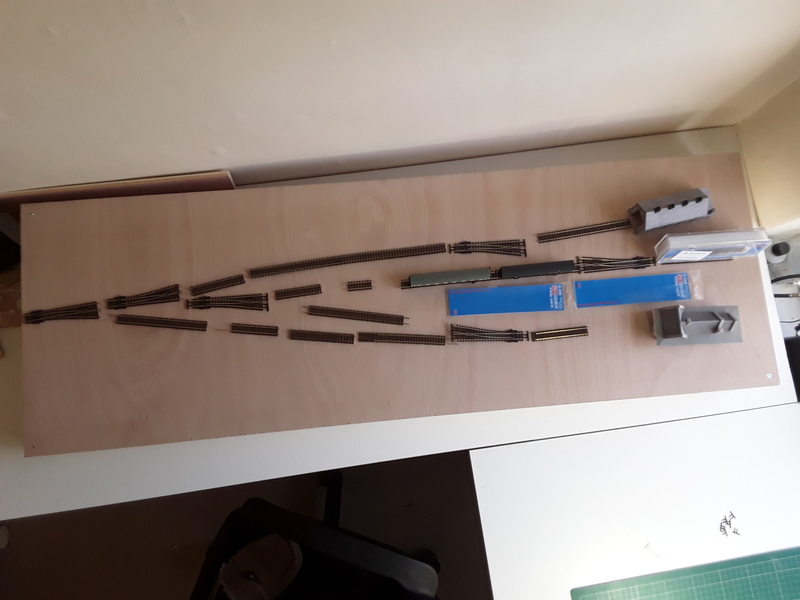 Next I taped some paper down and using various bits of rolling stock, marked out templates for the platforms. 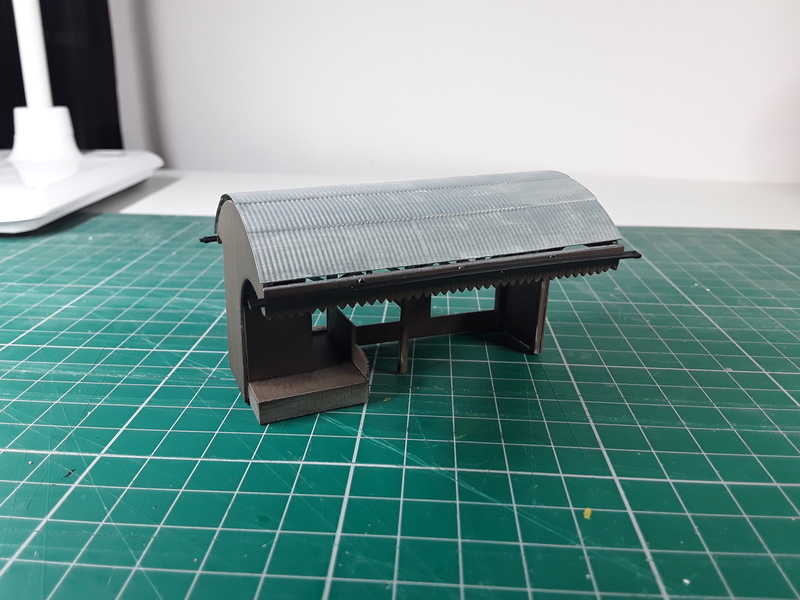 I used a Metcalfe platform kit to construct the platform structures and these will be topped with thin plastic card before being the surfaces are painted and weathered. 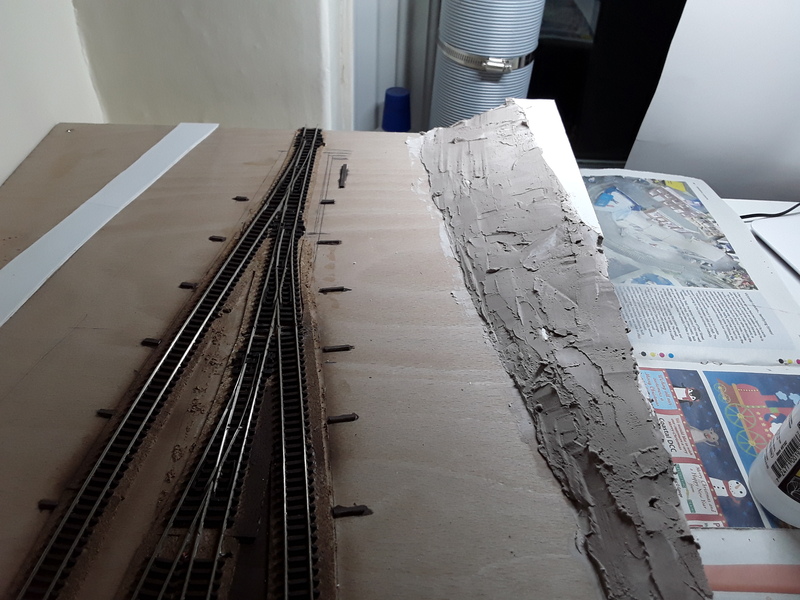 I find the tarmac surfaces supplied to be very inconsistant in colour and besides, not all platforms look like freshly laid tarmac. 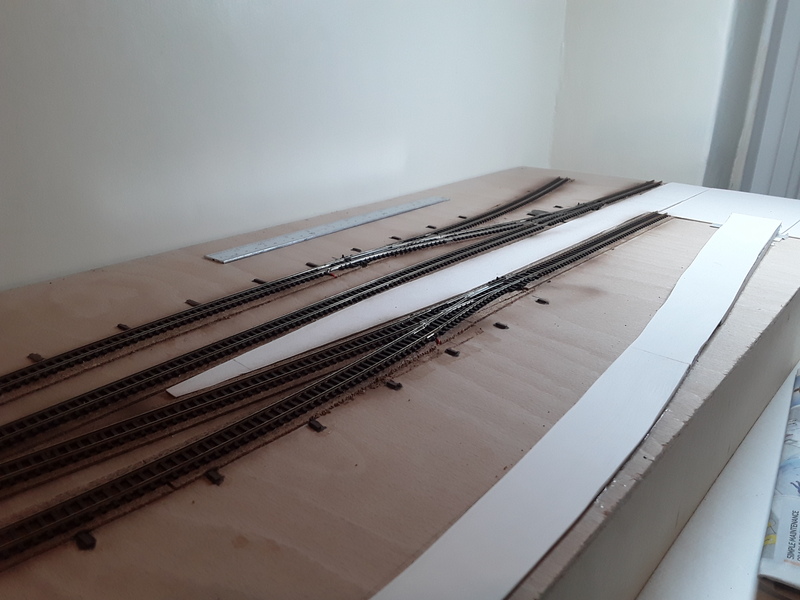 Next will be track laying heading left towards the loco depot.